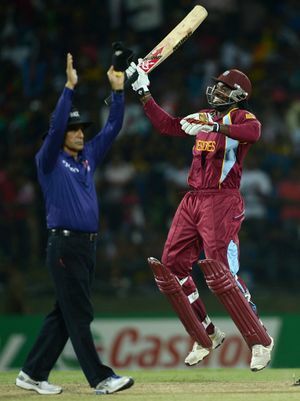 A demonic Chris Gayle is levitated by the all-powerful Umpire after trying to strike him for a Free Hit. COLOMBO, Sri Lanka -- ABC-TV was celebrating a huge ratings victory today, after almost half the United States watched its live coverage of the World Twenty20 Final of cricket, in which Chris Gayle's West Indies beat Mahela Jayawardene's Sri Lanka by 36 runs, 2 legs, 4 sets, 6 holes and a chimney. The coverage, which began when a disgruntled Pakistani technician on his last day at the network decided to hook up an illegal internet stream to every house in America, quickly became a televisual sensation, aided by excitement generated on social networks such as Facebook and Twitter, where the hash tags #Whatisthisshit? and #Whobrokebaseball began to trend. The initial tide of bemusement turned when "Windies" captain Gayle did a Gangnam style dance after a Sri Lankan batsman had been asked to resign. The entire nation, famed for its instinctive warmth towards black people, began cheering the Caribbeans on, and was rewarded with some exciting if inexplicable action. Despite a shaky start from the West Indies, where Gayle wasted a 50/50, a phone-a-friend, and an ask-the-audience on his way to a 16-ball 3, America watched as Marlon Samuels hit six home runs, three things where it rolls along to the edge of the pitch, and some other things that no one understood. Sri Lanka's innings never got started, with the West Indian pitch-bowlers throwing it good, allowing Gayle to do his dance 10 times, earning his team 3 of their 4 sets for style. ABC chiefs reported that their phone lines were jammed after the transmission ended, with callers applying traditional sporting clichés to a new context. One, Simon McDonald, said, "Man! I am so pumped! So pumped man! We whipped their asses! We did it! We stepped up to the plate, we gave 100%, and we crushed them man! USA!"